The Concorde simulator is at the Brookland museum, just 1 hour from London, with easy access from the M25 and A3. Built in 1974, the Concorde simulator cost today’s equivalent of £30M. By 1987 the sim had undergone a major visual system upgrade, at a further cost of £3 million, and which brought it in line with all the best sims around the world. Two thirds of the upgrade cost went on a Rediffusion SP-X 500/WIDE full-daylight panoramic visual system. This gave pilots a 150° by 40° view of projected, computer-generated images. The updates to the system also vastly increased the scope of the artificial landscape that it was possible to fly over. The original sim setup was limited to the single airport and surrounding scenery of the large models, whereas the new system enabled pilots to ‘fly’ to many of the major airports around the world. British Airways decommissioned the Filton based simulator in early 2004 – a few months after they ceased Concorde operations – and it was subsequently announced that it was to be loaned to Brooklands Museum. Later that year it was transported to the museum in two halves (see photo). Originally the plan was for just the cockpit section to go on display but a plan was soon formed to bring the simulator back to life, although, when it was decommissioned the sim’s motion system was scrapped so it is now a fixed base simulator. 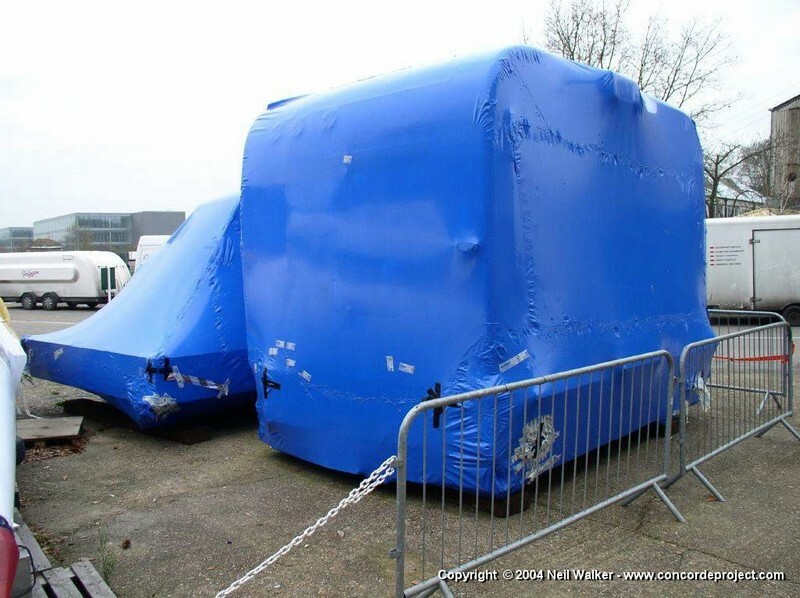 In January 2008 the simulator was moved into a newly refurbished room in a building next to Concorde Delta Golf and work got underway to rejoin the two halves and get the sim operational again. In June 2009 the simulator was officially opened to the public and it is now open for viewing, when operational constraints allow. The project to get the sim operational again was a joint venture between the University of Surrey (UniS) and the Engineering and Physical Sciences Research Council (EPSRC). It involved the integration of the existing simulator cockpit with modern flight simulation software. This was engineered by XPI Simulation Ltd, who are specialists in simulation software and hardware. The simulated environment is projected onto a large screen in front of the cockpit windows and Concorde is ‘flown’ using the original flight controls and system controls inside the simulator. This includes the control columns, trim switches, rudder pedals, throttles, reheat switches, landing gear lever, toe brakes and the nose and visor lever. Alongside this, nearly all of the instruments on the pilots panel are also operational. This includes the ADIs, ASIs, HSIs, VSIs, primary engine instruments, DME indicators, pressure altimeters, radio altimeters and also the famous Machmeters. As of the end of 2011, sections of the flight engineers panel have now been brought back to life as well. This includes Concorde’s complicated fuel control system. Over several months during Spring and Summer 2013 the simulator underwent a major upgrade of the visual system. This actually involved refitting the back projection screen and mirror from the original WIDE system that was fitted to the simulator when it was operational at Filton. These two large components were removed from the sim in 2003 and placed in storage at British Airways Flight Training facility at Heathrow airport, with a view to them being kept as spares for some of the airline’s other simulators. However, in 2011 BA decided they were no longer required and they offered both the screen and mirror to Brooklands. They were transported to the museum in early 2012. Refitting the back projection screen and mirror was both technically and logistically complex and took around 4 months to be completed by museum volunteers. It involved the partial dismantling of the simulator to remove the existing canvas projection screen and blackout frame, the relocation of all the computer and equipment racks and actually moving the simulator itself several feet to accommodate the large mirror. The screen and mirror of the WIDE system create what is known as a collimated display. A collimated display is focused to infinity and allows the projected images to appear the same to both pilots, eliminating distortion and parallax errors. The images are first projected on to the translucent back projection screen mounted above the cockpit and this image is reflected by the large concave mirror in front of the cockpit windows. The mirror surface is not glass – which would be both too heavy and very expensive – but actually a Mylar film which is drawn flat into a frame by a vacuum pump. Not only has the refitting of the original projection system greatly improved the visuals viewed through the cockpit windows, but, from a historical point of view, it has also returned the simulator to it’s original operational configuration.